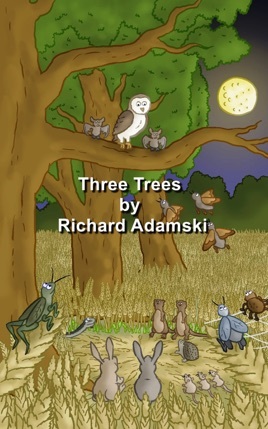 The story begins with woodland creatures going to Three Trees, three mighty oak trees that are situated in the centre of a cornfield. The Nobles (the wisest woodland creatures) inform everyone that Ron and Reg Crow twins and the Raven gang have returned to the area. Three seasons ago the Crow twins distributed bark tablets in the woodland. Now the Crow twins plan to take the sap from Three Trees to make the most addictive bark tablet ever. Three Trees is an enchanting fantasy adventure which paradoxically carries darker themes and undertones. Its setting and characters will appeal to any age group of reader - however its allusion to drugs: bark tablets (ecstasy), the weed (cannabis) and organized crime may limit readership to teens and adults. The plot may be used as a warning against involvement of drugs, with its anti-drug theme that runs throughout the story, or even a satirical commentary on the influence of gangs and organized crime on many youth of today. Whatever messages one may or may not perceive the story remains a fun and involving adventure with a wealth of unique and likeable characters.